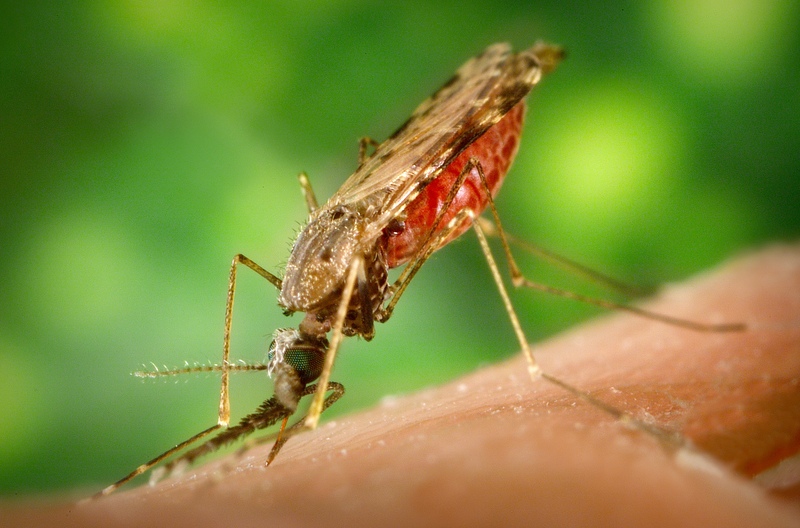 Anopheles quadrimaculatus Say is historically the most important vector of malaria in the eastern United States. Malaria was a serious plague in the United States for centuries until its final eradication in the 1950s (Rutledge et al. 2005). Despite the ostensible eradication, there are occasional cases of autochthonous (local) transmission in the U.S. vectored by An. quadrimaculatus in the east and Anopheles freeborni in the west (CDC 2005). In addition to being a vector An. quadrimaculatus can also be a pest species (O’Malley 1992). This species has recently been recognized as a complex of five sibling species (Reinert et al. 1997) and is commonly referred to as An. quadrimaculatus (sensu lato) when in a collection or identified in the field. The preferred hosts are large mammals including humans. Anopheles quadrimaculatus mosquitoes are primarily seen in eastern North America. They are found in the eastern United States, the southern range of Canada, and parts of Mexico south to Vera Cruz. The greatest abundance occurs in the southeastern U.S. Adults: Anopheline adults rest with their abdomens positioned at a discrete angle to the surface, whereas other species keep their bodies parallel to the surface, which makes them easy to identify when sitting on the skin (Rutledge et al. 2005). Species in the genus Anopheles have long palps equal in length to the proboscis. They are very dark mosquitoes covered in dark brown to black hairs. Anopheles quadrimaculatus has dark scales on the wings with patches of scales forming four darker spots on the wing (Carpenter and LaCasse 1955). Eggs: Females deposit eggs individually on the surface of the water. Preferred oviposition sites include fresh water streams, ponds, and lakes with aquatic vegetation (Carpenter and LaCasse 1955). The eggs are unique in having floats on either side. The eggs of Anopheles quadrimaculatus cannot survive drying/desiccation; they will hatch within two to three days after oviposition (CDC 2004). However, Jensen et al. (1994) reported that sibling species C1, Anopheles diluvialis, have adapted to floodwater conditions and their eggs can survive 28 days out of water under favorable temperature conditions. Larvae: The larvae lie horizontally at the surface of the water where they filter feed on organic material (O’Malley 1992). They do not possess the breathing siphon present in other mosquito genera. They obtain oxygen through the palmate hairs along the abdomen. The food sources include a variety of plant and animal matter suspended at the surface of the water and small enough to eat (O’Malley 1992). Pupae: The pupae of all mosquitoes are active and when disturbed will “tumble” from the water surface where they obtain oxygen, to the bottom of the aquatic habitat. Even though they are active, the pupae do not feed as there are no functional mouthparts during this stage. Like all mosquitoes, anopheline mosquitoes have four stages in their life cycle: egg, larva, pupa, and adult. The first three stages are aquatic and last five to 14 days, depending on the ambient temperature (CDC 2004). The adult females can live for over a month in captivity, but in nature most probably do not survive more than two weeks (CDC 2004). Adult males and females feed on plant sugars and nectar for energy. The females also feed on blood to provide nutrients for the developing eggs. Anopheles quadrimaculatus will feed on mammals including humans, domestic and wild animals (Carpenter and LaCasse 1955). The feeding preference is principally for ruminants, equines, lagomorphs and canines (Jensen et al. 1996). Human blood-feeding rates vary with proximity to the larval habitat and resting sites (Jensen et al. 1996). In the limited research that has been done on blood feeding by the different sibling species, there have been no differences detected in the host preference (Apperson and Lanzaro 1991). When resting mosquitoes are collected indoors, the human blood-feeding rate can reach 93%; but when collected from non-domicile sites the maximum rate is 18% (Jensen et al. 1996). Feeding occurs at night. During the day, the adults rest inside dark buildings and shelters in dark corners. Flight activity peaks a short period after dark, with limited flight for blood for the remainder of the night and at dusk they search for resting sites (Carpenter et al. 1946). Flight range is usually regarded as less than one mile under normal conditions, but is capable of much longer flights as demonstrated by mark and recapture studies (Carpenter and LaCasse 1955). Anopheles quadrimaculatus is more active in the summer months and exhibits slower development in the winter (Weidhass et al. 1965). Adult An. quadrimaculatus overwinter as fertilized females in colder climates. The overwintering adults stay in protected shelters such as barns, tree holes, and other dark protected areas (Magnarelli 1975). The number of broods varies by region with seven to eight in North Carolina, and nine to 10 further south (Carpenter and LaCasse 1955). Blood-feeding begins in the spring and declines in the fall, ceasing by November (Roberson et al. 1993). Population size is most closely associated with the availability of larval habitats, which in turn are associated with the water level (Weidhass et al. 1965). Seasonal changes of lake water levels are directly correlated with population size, with a lag of 14 to 30 days of peak water levels and peak population size (Robertson et al. 1993). Anopheles quadrimaculatus is the most important species in the eastern United States regarding malaria transmission. This species is susceptible to experimental infection with the parasite that causes malaria and has been captured in nature with salivary gland infection capable of transmission several times (Carpenter and LaCasse 1955). Although malaria has been considered eradicated from the United States since 1954, the CDC continues to report between 1,000 and 1,500 cases in the United States, the majority of which were acquired outside of the country (Robert et al. 2005). Even though malaria has not been a severe problem in Florida since the 1950’s (Rutledge et al. 2005), local transmission does occur occasionally. There were eight cases of locally acquired malaria reported from Palm Beach County, Florida, in 2003 (CDC 2005). The common features shared by outbreaks in the United States include 1) an initial case without known risk factors, 2) proximity to a person with parasitemia, 3) presence of known mosquito vectors, and 4) environmental conditions favorable to completion of the malaria parasite in the mosquito (Robert et al. 2005). The risks of importation and transmission of malaria are enhanced with the increase in immigration, global travel, and the presence of anopheline vectors (Robert et al. 2005). However, it is unlikely that malaria will cause major epidemics in the future in the United States because of the strong public health infrastructure and the shorter life span of the vector insufficient for complete development of the infective sporozoite (Robert et al. 2005). The reintroduction of endemic malaria can be prevented through prompt recognition, reporting and treatment of cases, and vector surveillance and control (Robert et al. 2005). In addition to malaria, An. quadrimaculatus may also transmit dog heart worm (Dirofilaria immitis) and some viruses such as Cache Valley viruses (Magnarelli 1975). Nyar and Sauerman (1975) tested host susceptibility of seven species of Florida mosquitoes to dog heartworm. They found An. quadrimaculatus to be highly susceptible to infection. Anopheles quadrimaculatus is also susceptible to infection with eastern equine encephalitis and has a moderate dissemination rate (38%) (Moncayo et al. 2000). Many regions have natural populations of An. quadrimaculatus with predominant populations occurring in the rice growing regions due to cultural growing practices (Efird et al. 1992). Fresh water is regularly added to rice fields. Anopheles quadrimaculatus oviposits soon after fresh water has been added (McLaughlin et al. 1987). The relative abundance of An. quadrimaculatus with Anopheles crucians varies as the conditions of the water in the field progresses from oligotrophic to eutrophic conditions (McLaughlin et al. 1987). In Florida swamps, temporary pools form on the swamp floor after rainfall events lasting days to months. Sibling species C1 is able to use these temporary pools and eggs can survive out of water and can be laid in damp soil allowing egg production after the pools have dried (Jensen at al. 1994). Government agencies such as the Tennessee Valley Authority (TVA) and the U.S. Army Corps of Engineers continue to administer programs that monitor and manage anopheline mosquito populations (Robertson et al. 1993). Resting boxes are the best trap method for an unbiased collection of the entire adult population (Weathersbee and Meisch 1988). Conventional mosquito control in rice growing regions uses resmethrin, malathion and permethrin for adult control. Resistance against malathion has been reported, and permethrin is less effective than resmethrin (Efird et al. 1992) for control of the adult stage. Bacillus thuringiensis israelensis (Bti) is an effective active ingredient for control of An. quadrimaculatus larvae in rice growing regions (Lacey and Inman 1985). Bti controls earlier instar larvae more effectively than late instar, but demonstrates a high level of control overall against the larval stage of An. quadrimaculatus. Economically, Bti may not be the first choice of control for many growers; however it is a good alternative to traditional insecticides in areas where resistance occurs (Lacey and Inman 1985). Gambusia affinis fish have been shown to be effective at controlling mosquitoes in white rice but not in wild rice because of variation in cultivation of the two types (Kramer et al. 1987). Some important differences are days to maturity are longer in white rice, and wild rice has a much fuller canopy, growing three times as high as white rice.